Autumn is such a pleasant time for me. I love to admire the fall foliage, get our my cozy sweaters, tour pumpkin patches, and eat pumpkin-flavored food. Well, all these good feelings have been swaddled up into a cute little children's book! 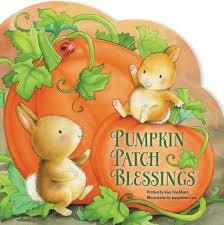 Two children--one boy and one girl--explore the blessings of fall. With birdies, bunnies, lady bugs, and other natural friends, they truly have a blast. The kids eat pumpkin pie and corn-on-the-cob. They ride a horse-drawn hay wagon. They even pick their own pumpkins. Throughout the hard-covered, full-cover story, the text is a nice sized font. With simple rhymes of a few lines per page, this book is suitable for pre-k through grammar school children. Also, while the book has blessings in the title, there are no religious undertones in the book.